The world’s ocean surfaces had their warmest summer temperatures on record, the US national climatic data centre said today. Climate change has been steadily raising the earth’s average temperature in recent decades, but climatologists expected additional warming this year and next due to the influence of El Niño. However, as Bob Tisdale and Anthony Watts point out at the latter’s blog, there are many reasons to be cautious about taking the claim at face value. It is the product of one dataset, and is not supported with data from satellites. Indeed, according to the UAH satellite record, the average temperature of the world in August was just 0.23°C above the average. The report also noted the continuing retreat in Arctic sea ice over the summer. Sea ice covered an average of 6.3m sq kilometres (2.42m sq miles) during August, according to the national snow and ice data centre. That was 18.4% the 1979-2000 average. According to the National Snow and Ice Data Center (NSIDC), Arctic sea ice covered an average of 2.42 million square miles during August. This is 18.4 percent below the 1979-2000 average extent, and is generally consistent with a decline of August sea ice extent since 1979. The difference between ‘18.4 percent’, and ‘18.4 percent below’ is 63.2 percent. But of course, it may well just be a typo than a reflection of Goldenberg’s misunderstanding of the science. But notice another interpretation. The original quote speaks of the 2009 ice extent representing the continuation of a general trend, ‘consistent with a decline of August sea ice extent since 1979’, ie, not as much ice as there was, once. But this is transformed in Goldenberg’s copy, and becomes ‘the continuing retreat in Arctic sea ice over the summer’, which is palpably not true. Perhaps you think we’re nit-picking by pulling Goldenberg up for what might well be the result of an honest misunderstanding married to a slack rewording of the press release. But what is strange is her apparent complete lack of surprise at the notion that summer ice has declined by a factor of five in such a short time. And that’s after two years of recovery. 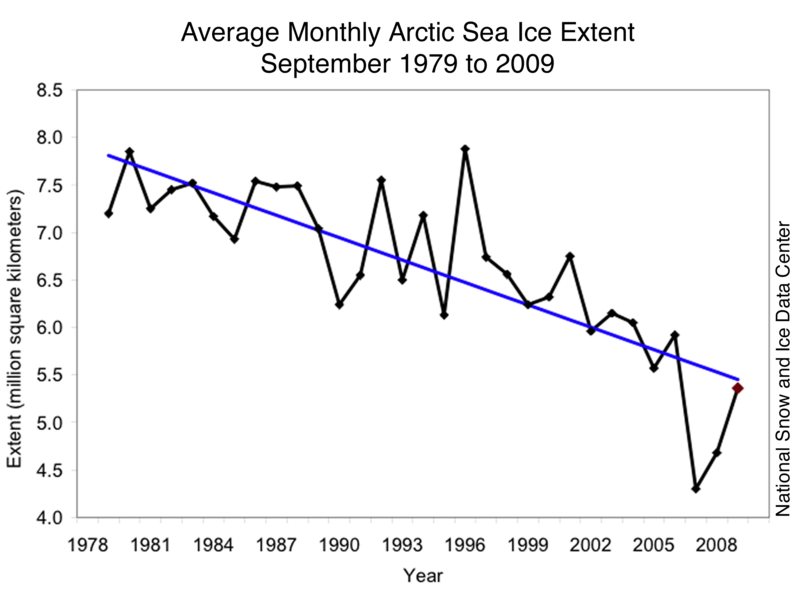 The minimum extent of Arctic sea ice in 2007 was 4.13 million Km2. in 2008 it was 4.67 million Km2. This year, it looks as though it is 5.25 million Km2. This represents an increase of 13% between 2007 and 2008, and an increase of 12% for 2008 to 2009, or an increase of 27% between 2007 and 2009. This is a substantial increase, yet Goldenberg puts emphasis on the loss, in spite of the rather more significant gain. As we have written previously, this is owed to the tendency of those who put much store in the progress of Arctic ice, hoping that it will add power to their alarmist narratives. When the ice doesn’t behave, the miserable story has to be told by a mathematical sleight of hand. Perhaps we should just be grateful that Goldenberg did not extrapolate back from her own made-up figure to discover that summer Arctic ice actually disappeared two years ago. It’s not entirely Goldenberg’s fault. She has been primed by years of press releases from the likes of NOAA and NSIDC to believe that the ice is retreating on an almost daily basis. As we have noted before, in their attempts to maintain the excitement, these agencies are caught between the temptation to overplay the importance of new datapoints that reinforce the idea of a downward trend, and the need to downplay those that don’t fit easily with the catastrophe narrative. Regardless of where a new datapoint falls on the graph, it’s a portent of doom. But in bending over backwards to make sure that no one gets the silly idea, on the evidence of a single datapoint, that global warming has stopped, they open the door to alarmist nonsense every time they update their graphs. ‘Revealed: the secret evidence of global warming Bush tried to hide’. The writers tell us that images taken from a US spy satellite ‘reveal the devastating impact of global warming in the Arctic‘. The images, now declassified, were ‘kept secret by Washington during the presidency of George W Bush’. The saintly Obama, by contrast, ‘is currently trying to galvanise Congress and the American public to take action to halt catastrophic climate change’. What separates Bush, the evil denier, from Obama, the saintly prophet, is their treatment of a cold, hostile, uninhabited, tract of frozen sea. Instead of being something which causes immediate concern in its own right, the real importance of images of open sea where there was once ice is that it gives seemingly geological scale to environmentalists’ claims about our influence over the planet and its likely consequences. Where scientific opinions and catastrophic story lines have failed to mobilise popular support for environmentalism, various greens appeal to our ability to register the difference between what once happened and what seems to be happening now. Accordingly, Goldenberg and Carrington present us with the before and after pictures. This picture is, according to the article, part of a series that are ‘the first graphic images of how the polar ice sheets are retreating in the summer’. This is sheer nonsense. Archived and near real-time Images of polar ice have been available to the public via the internet for years. The Polar Research Group at the University of Illinois have, since 2004, run a website called The Cryosphere Today, which allows users to compare the ice cover of the Arctic on any two dates. Here, for example, is an image depicting the same information as the recently declassified spy-satellite pictures. So keen are the ice researchers at the University of Illinois, there is even an application that can be run on web-enabled mobile phones. The iPod generation now have no excuse for being ignorant of the state of almost entirely uninhabited, entirely hostile, and least interesting regions of Earth. The US National Snow and Ice Data Center provide a similar means to staying in touch with the latest developments at the frozen North. (And who wouldn’t want to?) Using the Google Earth application, NSIDC aim to ‘help people better understand the cryosphere—where the world is frozen—by making our data more visible and interactive. What is available at the NSIDC is a vast array of images and data, none of which has been classified, all of which has been available for years. If you felt so inclined, you could even compare sea ice extent in July 2007 and 2008, to show just how remarkably quickly the Arctic recovered from its historic low. Or if you prefer, you could just go to the NSIDC homepage for ‘daily image updates of Arctic sea ice’. None of this is secret information. The only difference with the declassified images is the level of detail. Images in the public domain were only available at resolutions of 15 meters (each ‘dot’ in the picture represents an area of 15 meters square), whereas spy satellites create images at a resolution of one meter. Unless you are a climate specialist this makes no difference whatsoever. Prior to the release of these images, no researcher with an interest in the cryosphere would have been ignorant of the extent of sea ice off the coast of Alaska in 2007 as it stood in contrast to the previous year’s ice. So what’s the big secret, and why all the fuss? On the 15th of July, the US National Research Council released a report called ‘Scientific Value of Arctic Sea Ice Imagery Derived Products’. According to a NASA press release, the authors of the report believe that the higher resolution images would significantly extend scientific understanding of the processes driving the annual cycle of melting and freezing. There already exists a relationship between science and the military in which images produced by surveillance hardware is shared. Declassified images have, for a number of years, been put into the public domain through a program called Literal Imagery Derived Products (LIDPs). The satellites that have produced these new images have, at the request of the same scientific community in 1999, been recording images from locations within the Arctic region since 2005. The report made an argument for the release of the images. Just a few hours later, the Interior Department declassified them. Goldenberg and Carrington present the release of the images as, pardon the pun, a sea change in the attitude of the US government. But the satellites began recording the regions in 2005 – while Bush was president. If there had been no intention to make these images available to the scientists who requested them, why generate them in the first place? Moreover, the two writers seemingly make the case that an executive decision was made, by Bush in the first instance and Obama in the second, to respectively conceal, and reveal the images. Yet there is no evidence in the article, or on the web, that either president made any such decisions. It is only in the imaginations of bored journalists that the timing of the declassification of the images represents the termination of a conspiracy to deceive the public instigated by Bush. The facts are plain: nothing that wasn’t already widely known has been revealed by these images; the images are not useful to any political ends, either to inform the public, or to demonstrate the fact of global warming; there is no evidence presented that there was an attempt to conceal these images; there would have been no reason to keep the images secret; it was under Bush’s administration that spy satellites began recording images from the locations in question. There was no story. There is, however, the story in the heads of Goldenberg and Carrington. Routinely in this kind of narrative, the plight of polar bears, summer sea ice melt, global warming, and anthropogenic CO2 are conflated as the one and same thing, as each other’s cause and effect, rather than treated as phenomena that have distinct and complex causes. In this story, polar bears are killed by increased ice melting, which is caused by global warming, both of which will continue to increase, and all of which is caused by anthropogenic CO2, which is caused by us. These causal relationships are presented as unassailable scientific facts with no questions of complexity, nuance, or degree permitted. To argue that the progress of Arctic ice melt may well have a cause that is independent of the Earth’s warming is to deny both. To argue that polar bear populations may be increasing, or may be suffering for reasons other than ice melt is to deny global warming. Because ultimately, at the end of this chain of reasoning is an argument that owes nothing whatsoever to science: George Bush tried to hide all of this from you. A team of international scientists led by Dr James Hansen, director of NASA’s Goddard Institute for Space Studies, say that carbon dioxide (CO2) levels are already in the danger zone. Concentrations of CO2 in the atmosphere currently stand at 385 parts per million (ppm) and are rising at a rate of two ppm per year. This is enough, say the scientists, to encourage dangerous changes to the Earth’s climate. As a result we risk expanding desertification, food shortages, increased storm intensities, loss of coral reefs and the disappearance of mountain glaciers that supply water to hundreds of millions of people. Hansen has established his public profile by making incautious statements exaggerating the extent of global warming and its effects. Consequently, he is celebrated by the environmental movement. Yet, as we reported in the past, the curious positioning as a hero puts as much distance between him and the ‘scientific consensus’ represented by the IPCC Assessment Reports as there exists between the IPCC and any climate change ‘denier’. For example, where Hansen has warned of sea-level rises measured in feet, the IPCC’s most recent report talks of just inches. Hansen-worshipers answer that the IPCC is naturally conservative about its estimations. But on that basis, we might as well dispense with the IPCC – whose reports have successively down-graded their estimates of sea-level rise over the years – and indeed, science itself. The environmentalists switch their investment from the ‘scientific consensus’ to the maverick as it suits them. Not as much a credit crunch as a credibility crunch. A speculative bubble is forming around Hansen. Here at Climate Resistance, we have long argued that whatever the scientific realities of climate change, it does not justify the special politics that are demanded by environmentalists. This is partly because, however much warming the natural world is subject to, human society is far more dynamic, adaptable, and able to alter itself than the natural world. The human world is not an extension of the natural world. It is not weathered and changed by the elements. Although at any instant, human society is dependent on natural process to function, the instance of those dependencies are not what human society is predicated on. Human society has experienced all manner of climate problems, localised shortages of resources, and over-abundances of weather. But where it rains a lot, we build drainage systems. Where it doesn’t, we build dams and reservoirs, and divert rivers. We fertilise soil, irrigate dry fields, and build sea defences. Of course, there are the occasional failures of the systems we build, but where there has been the most development, people are far better protected than their predecessors. So why are scientists so worried about desertification, food shortages, increased storm intensities, and the disappearance of mountain glaciers’? Until this year, a bigger problem for the developed world than food shortage and desertification was an over-abundance of food production. Over the last few decades, many international organisations and governments have aimed to reduce agricultural production while environmentalists, claiming that that ‘climate change is happening now’ worried about decreasing fertility. This year saw record prices in food and fuel, but not because of peak oil, as was claimed, and not because of climate change. The reason for these price spikes is all too human. As we pointed out recently, in spite of Oxfam’s claim that the poor in Bangladesh are being ‘driven further into poverty because of climate change’, agricultural production and yield had increased, as had GDP. If poverty in Bangladesh is increasing, clearly it has little to do with a changing climate. Similarly, there is little evidence that storm intensity and frequency are increasing. While ice extent may indeed be ‘out of our control’, (as if it was ever in our control) the issue for humans is not controlling the weather, but controlling our vulnerability to it. We do that, not by aiming to control the weather one way or the other, but, as described above: adapting to become resilient to the weather, and to controlling the local environment. Hansen’s alarmism loses sight of our ability to adapt. Perhaps glaciers will melt. But for the ‘hundreds of people dependent on rivers originating in the Himalayas, Andes and Rocky mountains’, all is not lost. If glaciers melt, it says little in the general sense about the net input to those glaciers. It will still rain and snow in the Himalayas, Andes and Rocky mountains. The water will still flow downhill, as it always has. This creates a new opportunity for dam-building, putting the elements more concretely under our control. And there is the rub. Environmentalists don’t actually want things to be under our control. The objective of environmentalism – some kind of synchronicity with the natural world – is not based on necessary principles emerging from climate science, but on an ethic, a higher purpose of which we are mere subjects. Similarly, being able to make statements about what the future consists deprives the environmental movement of its capital: fear. For if we were able to make definitive statements about what the future might bring, we could develop accordingly, again, extending our ability to control adverse effects. Hansen’s fear and uncertainty about the future will drive society into a catastrophe of its own making, not one inflicted by an angry Gaia. As we have said before, environmentalism is a self-fulfilling prophecy; the more we believe that society is determined not by ourselves, but by climatic effects, the more we will organise ourselves around the idea, limiting our ability to respond to climate – changing or not. There is one side of me that really hopes I can get there, that I can kayak all the way from Europe to the North Pole. Because if I’m able to do that, I hope I’m able to show world leaders just how much the Arctic has melted, and just how much it’s going to affect each and every one of us. But then there’s the other side of me which says I really hope I don’t get there – I hope I fail, I hope I don’t succeed. Because if I am successful, then it’s a very worrying situation, because it shouldn’t be possible to kayak right across what used to be a frozen ocean. It would certainly be an impressive feat of paddling. But Pugh should not kid himself that he is raising awareness; he is simply riding a mighty bow wave of awareness that has already been raised by the mainstream media, environmental activists and scientists. The progress of the Arctic ice melt has been this year’s big climate story. Following an unusual winter, with record snows in China, Baghdad, and across the world, climate alarmists were unable to supply the media feeding-trough with upwardly-record-breaking statistics. After dismal 2007 and 2008 summers, and unusually heavy and late wintry storms, the public wouldn’t buy the idea that the UK was being ravaged by global warming. And as we all know, the Antarctic isn’t warming. Consequently, all eyes pointed north, which has caused much rumination over the significance of the level of ice at the end of the 2008 Northern Hemisphere’s summer. The Arctic has become less the subject of scientific investigation, and more the arena for a battle. Just as environmental policies are based on the precautionary principle, global warming alarmists exploit the unknowable territory of the future. It is not knowledge which drives environmentalism, but the unquantified possibility of catastrophe. Quantified risk spoils the story, because quantified risks allow the possibility of solutions. So alarmism seeks refuge in the furthest reaches of the world’s most inhospitable locations, where it cannot be challenged. It is no accident that the harsh landscapes of the developing world and the polar regions are where the bulk of arguments about global warming rest, it is hard to get there, and it is almost as hard to get people from these places to tell you what it’s really like, and what they really want. Thus, environmentalists speak for distant people, and far off lands… and polar bears. In much the same way, quantum physics is frequently used to ‘explain’ parapsychology and quackery; telepathy and precognition, ghosts, and homeopathic medicine. The harder it is to penetrate the science, the better a home it makes for ideas that owe more to wishful than rational thinking. In order to achieve leverage in the political arena, environmentalists have had to construct story-lines to keep the idea of climate change alive in people’s consciences. These double-up as morality plays, in which ‘climate criminals’ are responsible for the plight of species such as the polar bear, and poor people throughout the world. Unfortunately for environmentalists, science cannot produce data and research fast enough for them, and to a sufficient level of certainty. Therefore, the stories come and go. If there’s a hot summer, we are told to expect them to get hotter, and more frequent. If there are floods, we are told that they too will get more frequent and intense. And so on. The abstract results of climate research do not connect with the public as well as images of catastrophes and starving animals, nor with people’s direct experience of the weather. Climate change is perhaps the gravest calamity our species has ever encountered. Its impact dwarfs that of any war, any plague, any famine we have confronted so far. It makes genocide and ethnic cleansing look like sideshows at the circus of human suffering. A car is now more dangerous than a gun; flying across the Atlantic is as unacceptable, in terms of its impact on human well-being, as child abuse. The rich are at play in the world’s killing fields. The problem George has is in convincing people that any of this is true is that it defies all their senses. There is no visible climate chaos, such as he describes. Sure, there are occasional floods, heavy rain, and heatwaves, and so on. But there always has been. For those affected, life eventually returns to normal, and for the vast majority of people who remain untouched by these events, life carries on. Where people are less fortunate, such as in the developing world, George attributes their misfortune to climate change, whereas a much more compelling argument is that their predicament is explained by their poverty. He wants to say “IT’S HAPPENING NOW”. But alas, it is not. We all know what ice is. It is fairly evident when it is there. It is not some unusual social or scientific construct. So if you divide the amount of ice there is today, by the amount of ice there was yesterday less the amount of ice there is today, then you should know for certain how many days we have left until the end of life on Earth. Or, at least, that is the depth of thinking behind the current round of alarm emerging from the polar melt debacle. A lot of the heat has been generated by a graphic issued by the National Snow and Ice Data Centre (NSIDC), showing sea ice extent over the summer months. The question is whether the blue line representing 2008 will match the dotted green line representing the record-breaking 2007. Well, that’s supposed to be the question. The reality is that the progress of the curves represents a real-time unfolding narrative, rather like a soap opera, which gives gravity to the background and humdrum story-lines of who-is-in-bed-with-who, villainous schemes, and blood-feuds. Will the deniers finally be exposed as ruthless and back-stabbing murderers, or will they once again foil the valiant efforts of the greens? Tune in, for the next exciting episode. Except that, just like a soap opera, it never ends. The turn of the curve provides the tension of the moment, but it never fuly resolves. A new story line emerges as the old one fizzles out, with the plot left slightly hanging, so that its protagonists can return at a later date (ie, when the writing team have run out of ideas). We need to get prepared for four degrees of global warming, Bob Watson told the Guardian last week. At first sight this looks like wise counsel from the climate science adviser to Defra. But the idea that we could adapt to a 4C rise is absurd and dangerous. Global warming on this scale would be a catastrophe that would mean, in the immortal words that Chief Seattle probably never spoke, “the end of living and the beginning of survival” for humankind. Or perhaps thebeginning of our extinction. See how the narratives stack up? At the top, global warming provides the situation. Beneath, sub-plots such as the ice extent story provide battle grounds for the constant war. At the bottom layer, the groupings and affiliations of goodies and baddies give rise to the politics. And in the sludge, the turbulent challenges that the heroes face. How can Tickell Jr. keep on side those who are losing faith in the good fight, and who appear to be making concessions to the enemy? In that week’s installment, the blue line had nudged slightly closer to the green dotted one. Everybody held their breath. Who would be vindicated: the deniers, or the warmers? Steven Goddard broke the silence on The Register, after noticing that the NSIDC graphs showing this year’s ice retreat didn’t match the graphics published by the University of Illinois. More importantly, the data did not support the panic that the Pole might be free of ice this summer, as had been reported by various news outlets, and attributed to David Barber of the University of Manitoba. This was upped by Dr. Olav Orheim head of the Norwegian International Polar Year Secretariat, who claimed that the entire polar cap might disappear. Others were more circumspect, yet still predicted that this year’s melt would be worse than last year’s. Yet the NSIDC data failed to show this. It looked like the deniers would be vindicated. A National Geographic article captured the confusion which the characters of the soap opera were caught up in. It was written in June, just before the little blue line stopped following the trajectory set by the progress of ice last year. As has been mentioned, David Barber raised the possibility of an ice-free 2008 Arctic summer. Next up in the article, Sheldon Drobot, at the Colorado Center for Astrodynamics Research lowered the stakes, saying that some ice might survive, but it might melt at the pole. But then the magazine announced that models suggest an ice-free Arctic is not likely until 2013. Spoiling the party, Ron Lindsay, of the University of Washington, Seattle’s Polar Science Center tells NG that, “Nobody knows for sure.” Finally, the article concludes that, whatever the differences between the predictions, “Almost all models have the Arctic completely ice free in the summer by 2100.” We might have to wait nearly a whole century for this plot line to terminate. Over the course of just 700 words, Aalok Mehta, the article’s author, had taken the viewers from a frenzy of expectation about a sensational conclusion, headlined “North Pole May be Ice Free for First Time This Summer”, down to the disappointing perpetual cliff-hanger. The suspense was killing us. We had to find out more. Like fans possessed, we sought the contact details of the actors in the drama. What was the truth? What would the next turn of the plot be? Would ice disappear this summer? Or would it be 2013, as had been predicted by a model created by Professor Wieslaw Maslowski of the Naval Postgraduate School in Monterey, California. Or would we have to wait a century to find out? NSIDC senior scientist Mark Serreze was on hand to help put us straight. The Observer and National Geographic articles were simply ‘tabloid’ journalism. For fans of the drama, it is a disappointment. But it was an improvement on the 100 years given by the NG, and 50-100 years given by IPCC’s AR4. Serreze says that the IPCC’s predictions are conservative, and that new data has come to light since AR4. The melt had proceeded faster than expected. But what about the sub-plot – the 2008 melting versus the year before? Serreze’s colleague, Walt Meier, had contacted The Register to tell them that Goddard was mistaken. There are two different ways of measuring arctic ice, and they shouldn’t be compared. The absolute numbers differ between the UI and NSIDC plots because UI is calculating ice area, while NSIDC is calculating ice extent, two different but related indicators of the state of the ice cover. However, both yield a consistent change between Aug. 12, 2007 and Aug. 11, 2008 – about a 10% increase. The extent values are useful in a temporal series, but caution should be used citing the numbers apart from the time series or comparing with values derived from other studies. Ice concentrations are sensitive to the algorithm used, and resulting numbers for extent depend not only on algorithms but on other processing steps as well. The extent values have uncertain significance when taken individually. For example, the 15% concentration cutoff for extent is somewhat arbitrary. Using a 20% or 30% cutoff will give different numbers, although similar trends, for extent (for examples, see Parkinson et al. 1999). For a moment, it looked like the deniers had seized the day. But Meier stole the plot back for the warmers, to accuse Goddard for an article which “consists almost entirely of misleading, irrelevant, or erroneous information about Arctic sea ice that add nothing to the understanding of the significant long-term decline that is being observed”. Oh? Goddard’s error was in thinking that an absolute index of ice existed – for which he apologised. But what about the claims that 2008 would be worse than 2007? And the claims that the North Pole and even the entire ice cap may be ice-free this year? Was it misleading to ask questions about those? Were they not themselves misleading? Is it misleading to point out that 2008 was not turning out to be ice-free? The ball was no longer in anyone’s court. The blue line carried on. … essentially we had a perfect atmospheric storm, in which we had a pattern of winds that brought warm air to the Arctic and helped melt the ice. Like El Nino is largely responsible for the high global temperatures in 1998, we ask. Exactly, replies Serreze. “An Arctic Ocean that is ice-free in summer is inevitable,” he said. Any recovery made by the ice sheet, he said, wouldn’t last “more than a couple of years in the best case scenario.” By the summer of 2030, he says, the Arctic will be completely ice free for a few weeks at a time. CR: So what sort of confidence intervals do you have around the 2030 figure then? MS: Well, just that it’s an educated guess based on where we’re going. If you look at what the climate models have been saying – this is from those that were in the latest round of the IPCC, OK? – they’re saying that, depending on the model you select as the truth, you could be going to an ice-free Arctic Ocean anywhere from say 2050 to anywhere out beyond 2100. That’s what the latest round was saying, OK? About a year ago now, we had a paper led by my colleague Julienne Stroeve, which was showing that the current rate of decline is faster than any of these climate models are telling us. In other words, we are sort of faster than forecast […] when we say 2030, as the number that we throw out there, it’s based on the recognition that the models are too slow. And it’s based on just looking at what the observed behaviour of the system has been. So that 2030, you know, you wish I could put error bars around it – plus or minus seven years, right? Serreze neither explains what this tipping point might be, nor why his NSIDC data suggests we might be passing it. In this sense, ‘tipping point’ is used simply as a sciencey-sounding synonym for ‘something terrible might happen’. And reporters don’t even think to ask him what on Earth he is talking about. Numbers are now available concerning current Arctic sea ice extent compared to the previous second-lowest year, 2005. Visit http://nsidc.org/arcticseaicenews/ for more details. When you’re talking to the public and the press and so forth […] adding areainto the discussion can cause confusion. So we’ve kept to extent to keep things consistent in how we’re reporting things and reporting one parameter instead of two […] We’ve chosen to not include the area [data], even though there are interesting things to say about it, just because, for a lot of people, it does tend to muddy the water. The irony is that the simplistic messages they put out are far more confusing than the state of knowledge in its full complex glory – as witnessed by the confusion generated by a year’s-worth of simplistic predictions and press releases. Keeping things simple for the press and public has other implications. The NSIDC’s raison d’etre is to provide the data, which can then be used by scientists to describe and predict ice behaviour. Scientists obtain that data through the same website used by the press and public. And unlike the extent data, the area data is very hard to find. Try it. Could it be that the area data has not been scrutinised like the extent data simply because it is buried so deep within the website? If so, we have a strange situation in which the PR strategy of the NSIDC directly influences the nature of scientific investigation. If the importance attached to NSIDC blue line is strange, then so is the fascination with the arbitrary ‘ice-free summer’ landmark. Like frogs spawning earlier or butterflies flying later, ice-free Arctic summers are, in themselves, neither evidence for global warming, nor a harbinger of doom – and yet that is exactly how it is used in the media. All are consequences of climate change. If global temperatures have been a bit higher than usual recently, it’s the most natural thing in the world that species adjust their life-cycles accordingly and that ice melts that bit faster. We should be far more worried if frogs did not make the most of an early spring, or if ice didn’t melt when it got hotter. The twists and turns of little blue lines excite the audience, and provide superficially important news fodder. It fuels debates, but with wild speculation and utterly meaningless and inconsequential factoids that will be forgotten by the time the next climate record is set. Repeat ad nauseam. These artificial dramas are elevated to ludicrous heights by claims that our entire futures depend on them. Consequently, life imitates this art. The drama extends into our real lives. It becomes politics, ethics, laws. The more we look to little blue lines, the less we realise that whatever little blue lines do only determines what our existences will consist of if we believe that the direction of the little blue line is instructive. It isn’t. As we have argued before, environmentalism is a self-fulfilling prophecy, because environmental determinism – upon which environmentalism is founded – posits that human history is the product of environmental conditions. If ethics, politics, and society is formed according to the twists and turns of blue lines because we decide that it ought to be, then sure enough, history will be determined by little blue lines. We will make ourselves vulnerable to climate in order to prevent climate change catastrophe. The fact is that human history occurred in spite of the direction of blue lines. Although the expedition is over, in many ways the real work is still to come – my job now is to act as an ambassador for the Arctic, to convey to policy makers the changes that are taking place here. This starts immediately – I am going to Washington DC soon to speak to the House Select Committee on Energy Independence and Global Warming. I spoke with Congressman Edward Markey (D-MA) and his team in May, and it was a wonderful conversation – one I look forward to continuing. Smart people working hard to push these important environmental issues forward.